Your shoulder is the most flexible and moveable joint in your body, consisting of several bones, muscles, joints, and tendons. This means there are several ways the shoulder can become injured and cause pain. There are many causes of shoulder pain and steps you can take to eliminate the discomfort. Physical therapy is an effective way of treating several types of shoulder pain. Call our office to find out how working with an experienced physical therapist can help ease your shoulder pain. Sometimes, a sudden injury can occur that causes shoulder pain. Other times, repetitive motions can gradually cause joints, tendons, and muscles in the shoulder area to hurt. Physical therapy can treat several specific conditions that may be contributing to the pain in your shoulder. A physical therapist can create a customized program to specifically meet your needs. A torn cartilage can produce a number of painful symptoms. These include a limited range of motion, decreased strength and clicking sensations when you’re moving your arm. You may also experience pain when moving your arm in certain positions. Physical therapy can provide pain relief if you’re suffering from a torn cartilage. Bursitis, or joint inflammation, often occurs in areas of the body that are used in the same repetitive motions. It specifically affects the fluid-filled sacs that surround and cushion the tendons, muscles, and bones. Symptoms can include stiffness, achiness and the area appearing red or swollen. You’ll want to try physical therapy to ease your painful symptoms. A physical therapist can provide pain relief for a variety of conditions while also improving flexibility and range of motion. A trained physical therapist can use cold or heat therapy to ease pain and increase mobility. They often implement different types of manual therapy. 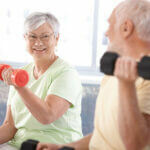 Physical therapy could include kneading and massaging specific joints, tendons and muscles in the shoulder area. Contact First State Rehab at Home that serves the surrounding areas of Wilmington, Edgemoor, New Castle, Newark, Smyrna, Dover, & Delaware City, DE.